Harrisburg, PA – Governor Tom Wolf and his administration’s Opioid Command Center, including the Pennsylvania Department of Drug and Alcohol Programs (DDAP) and Pennsylvania State Police, encourages all Pennsylvanians to take part in the Drug Enforcement Administration’s (DEA) 16th National Prescription Drug Take Back Day initiative tomorrow, October 27, 2018. 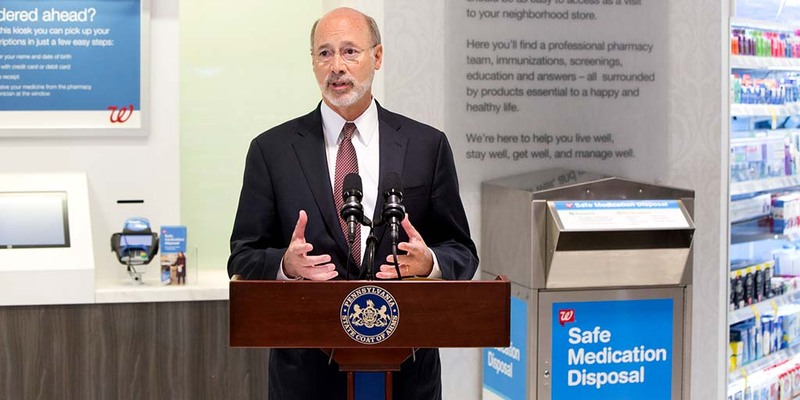 Since the inception of Pennsylvania’s drug take-back program in 2016, there have been more than 440,000 pounds of prescription medication destroyed, with more than 800 take-back boxes established in all 67 counties throughout the commonwealth. Last year, the Pennsylvania State Police installed prescription drug take-back boxes at 65 stations that are available 24 hours a day, 365 days a year.